Games will have TWO, 24 minute halves with a continuous clock (5 minutes between each half). Substitutions will be at the 16 and 8 minute mark without stopping the clock. All players play the same amount of time in a game. See Player Playtime Matrix. No fast breaks, except in a steal situation for the Beta League (3rd/4th grades). Fast breaks are allowed for the Alpha League (5th/6th grades). At the end of every game, each player from each team shoots one free throw. Made free throws count toward the final game score. Defense can not apply pressure until the offense advances the ball past half court. For the Alpha League, the offense must advance the ball to half court without dribbling; passing only for the first half. The Beta League can dribble to half court. 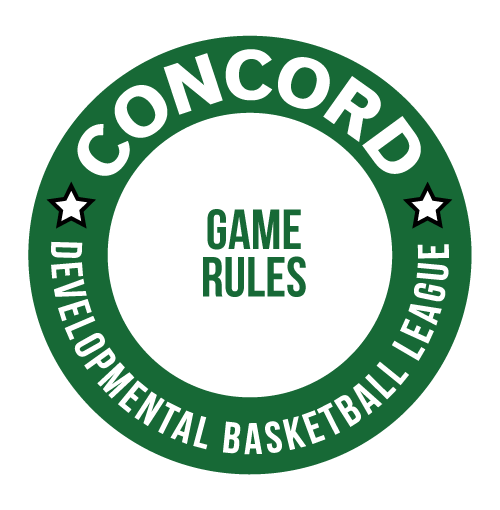 Prior to each quarter players will be matched up for defensive purposes. Players must only cover their matched partner. Colored wrist bands are provided to the Beta League to help the players identify who they are to cover. ﻿No double teaming﻿. A player may stop the advancement of another player causing a double team situation, but must immediately return to covering his matched player after the advancement is stopped. Zone defenses are not allowed. When a player is fouled in the act of shooting, two foul shots will be awarded. A player may be removed from the game by the referee for excessive fouling. If a player is removed for foul reasons, the time out from the game does not constitute "non-playing" time for rule #1. The foul line for the Beta League will be two feet closer than the standard foul line. The Alpha League will utilize the standard foul line. The free throw will be negated if the player steps on the free throw line during the shot. If a player argues with a referee's call, or in the opinion of the referee a player has a significant attitude problem, the referee, at his discretion, may have the player removed from the game. The referee must explain the reason for the decision to the player and the player's coach. The purpose of this rule is to emphasize that good sportsmanship is critical to the game. Continued issues may result in sitting out the remainder of the game and expulsion from the League.